Ensuring the celebration of pluralism within our work and in ensuring that the identities of people are valued in the rich mix which make up our country. Faith Matters also believes that those who seek to impose their will and their outlook of life do not add to the sense of pluralism that is so much part of our country. Furthermore, we believe in values which include the right to speak freely within the framework of civil and criminal laws, ensuring that we stand against intolerance, hatred and prejudice where we come across it, and respect for the laws of the land. These are values that are fundamental to our work. 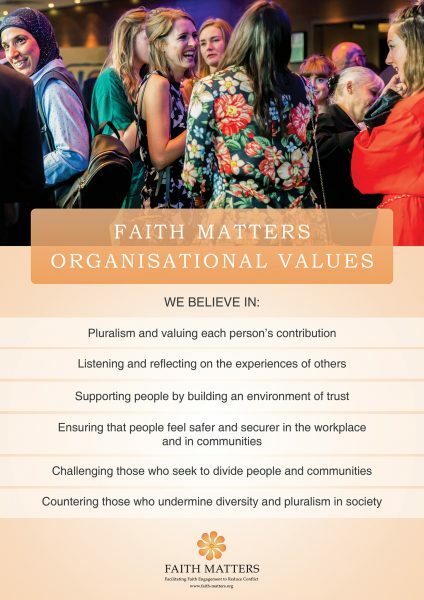 Faith Matters places human rights at the core of its work and is led by this fundamental universal value. This means placing a focus on the rights of individuals and with a focus on ensuring that their voice is heard in the national community projects that we undertake. We commit to act in the public interest at all times, to be open, honest transparent and accountable in all that we do, submitting to scrutiny if required and challenge unacceptable behaviour if and when necessary.